Ideal created one of the most bizarre action figure/playset lines of the 1980's: the Manglor Mountain and the Manglor series. 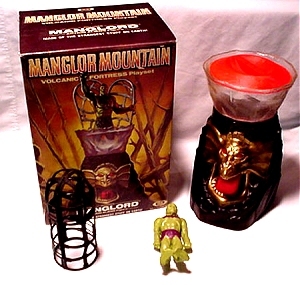 This off the wall toyline consisted of a Volcanic Fortress Playset known as the Manglor Mountain, complete with Manglord and an iron maiden. The three figures were Manglord; "The Leader of a man-like race of tribal warriors", Manglosaurus; "a terrible creature and mortal enemy of Manglord" & Manglodactyl; a "feared winged hunter of the sky." All three figures were made of a rubbery-like compound that could be pulled apart and mushed together with any other of the three figures part to create a multitude of different Manglors figures. The box actually states that the compound is "Made of The Strangest Stuff on Earth". This stuff beats goo, slime, stretch, floam and any other wierd stuff your mom was afraid would stain here green-n-amber couch! The line started in 1983 and died that same year. As for prices, how can you place a value on having magic-goo action figures in your toy collection?